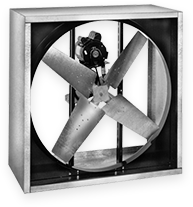 Keep the air flowing — and conditions comfortable — inside your metal buildings with an industrial wall-mount fan from Metallic Products. Designed to pull warm air from a space quickly and efficiently while requiring minimal maintenance, this cost-effective option is your answer to quality ventilation. As an added bonus, our wall-mount fans can be easily painted with an enamel or epoxy finish to blend in with a building’s roof panel.